Ball Crazy is a remake. Originally this game was released in 1987 for Amstrad, Commodore 64 and Spectrum. 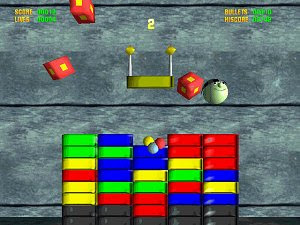 Bounce Erik the ball around the screen, change the colours of the blocks, pick up the bonus objects and fight off the 'Chasers'. Simple as that! Just hit the download link and get Ball Crazy.